In the series … We already knew Red & Black Ford Series on the Fiesta. Here now the Back & White still on the Fiesta but also on the Ka. The Red & Black plays on the contrast between red and black. Won, the Black & White also plays on the contrast but between white and black. This series is declined on the Fiesta and Ka. “White is a sheer color that contrasts perfectly with the sophistication of black. 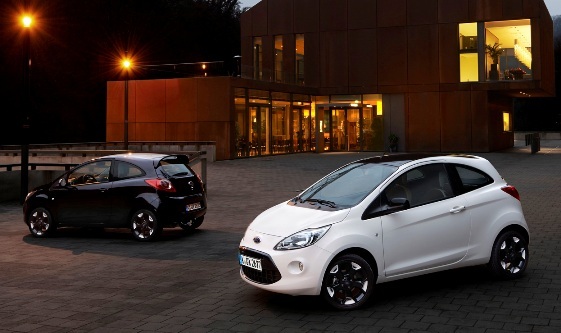 This combination provides elegance to the Fiesta as the Ka”, commented head of design at Ford Europe. The Ka of the genus (containing the equipment of the Titanium finish) and thus offers a combination between celestial black and white crystal tone between body, rearview mirrors, roof, etc. The interior follows this trend with stitching, trim or inserts. Black & White Ka is strictly moderated by the 1.2-liter 69 hp and also gaining 16″ rims. Price 12,350 euro. 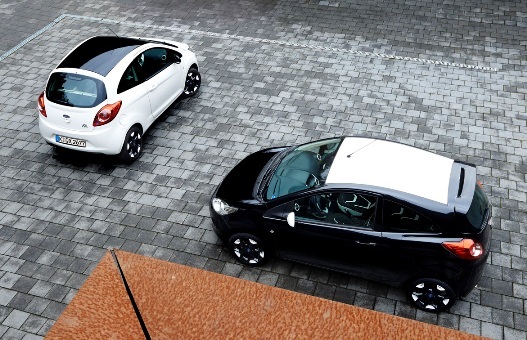 Fiesta with the SYNC system to play its part on the same register but with the Scala black and Glacier white color. It should also be noted 15″ diamond wheels. On board it is of the same ilk. Mechanical offer is based on the 1.5 TDCi 75hp and 1.6 TDCi 95hp and 1.0 EcoBoost 100hp S&S and 1.25 Duratec 60hp and 82hp. Available in 3-door or 5-door entrance of 14,650 euro.